The Wyoming Secretary of State requires one completed original Wyoming Articles of Incorporation as well as one original Consent to Appointment by Registered Agent completed by the Registered Agent obtained for this corporation. These articles may be filed by mail (Wyoming Secretary of State, 2020 Carey Avenue, Suite 700, Cheyenne, WY 82002-0020) and paid for with a check made out to “Wyoming Secretary of State” or filed online (http://soswy.state.wy.us/default.aspx) and paid for with a credit card. The Filing Fee is $25.00 and must be paid for in full to the Wyoming Secretary of State in order for this paperwork to be reviewed and processed. Step 1 - Save the Wyoming Articles of Incorporation Nonprofit corporation to your computer by selecting the above link. You will need a PDF or a browser with PDF form capabilities to enter the information onscreen. Otherwise, you may print the articles then fill them out manually so long as you use black ink and it remains perfectly legible. Step 2 - Locate Article 1. Here, there will be a space provided so that you may report the Full Name of the corporation being formed. Make sure this Name is wholly unique, meaning that no other entity uses or controls it. Step 3 - Article 2 seeks a definition to the corporate type you are forming. There will be three check boxes, labeled Religious, Public Benefit, and Mutual Benefit. You must check the box that best defines the type of corporation being formed. You may only choose one of these as a definition for the entity type. Step 4 - Article 3 will contain two blank boxes. The first one will require the Full Name of the Wyoming Registered Agent to be entered. The second one will require the Full Address of the Wyoming Registered Office is physically located. It may not contain a PO Box, thus if the Wyoming Registered Agent has a separate Mailing Address, you will need to report both the Physical Address and the Mailing Address here. 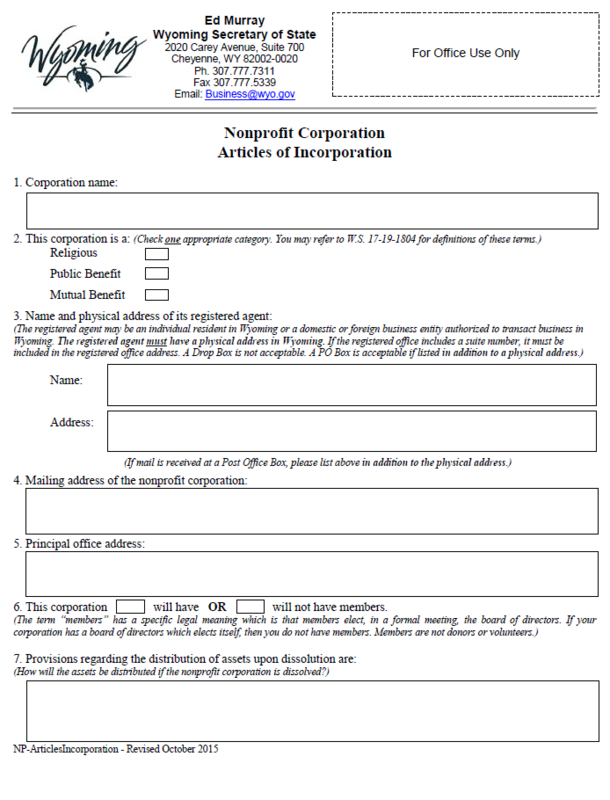 Step 5 - In Article 4, report the Complete Address of the nonprofit corporation being formed by these articles. Step 6 - Document the Complete Address for the nonprofit corporation’s Principal Address in Article 5. Step 7 - If this nonprofit corporation will have Members then check the first box in Article 6. If not, then mark the second box in Article 6. Step 8 - Report all the provisions in place for distributing the assets of this nonprofit corporation, upon its dissolution in Article 7. Step 9 - Report on the Type of Business the nonprofit will be conducting in the State of Wyoming in Article 8. This should be a statement regarding the corporate purpose and how the nonprofit will conduct its activities. 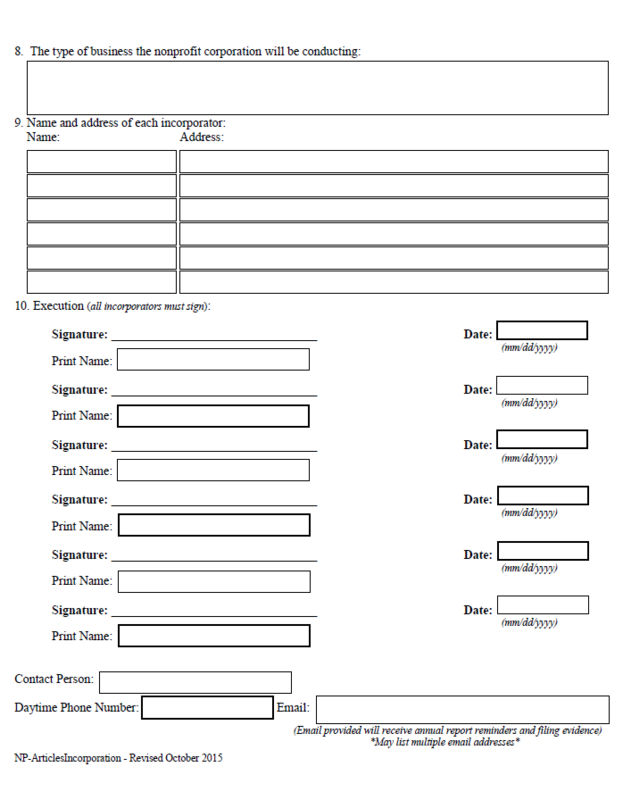 Step 11 - In Article 10, “Execution,” each Incorporator listed in Article 9 must Sign his or her Name, Print his or her Name, and report the Date of Signature in the spaces marked “Signature,” “Print Name,” and “Date” respectively. Step 12 - Below Article 10, will be an area where you may enter information regarding the Contact Person. This will serve as the first point of contact for the Wyoming Secretary of State when a correspondence is necessary. In the first box, labeled “Contact Name,” report the Full Name of the Contact Person. Then in in the boxes, labeled Daytime Phone Number and Email, report a reliable Phone Number and Email Address (respectively). 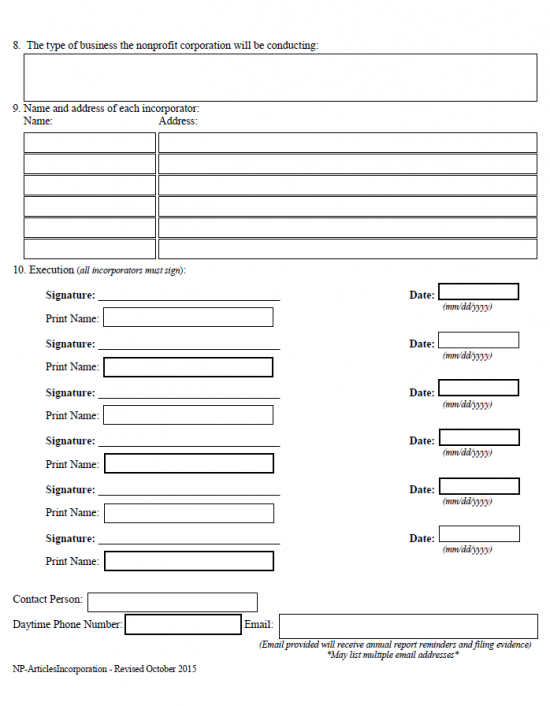 Step 13 - Once all the information you have gathered has been entered into the Wyoming Articles of Incorporation Nonprofit and any other required paperwork has been received/produced then attached (including the Consent To Appointment by Registered Agent), you may send the complete Wyoming Articles of Incorporation Nonprofit Corporation package with a check for $25.00 (Filing Fee) made payable to “Wyoming Secretary of State” to the Wyoming Secretary of State.